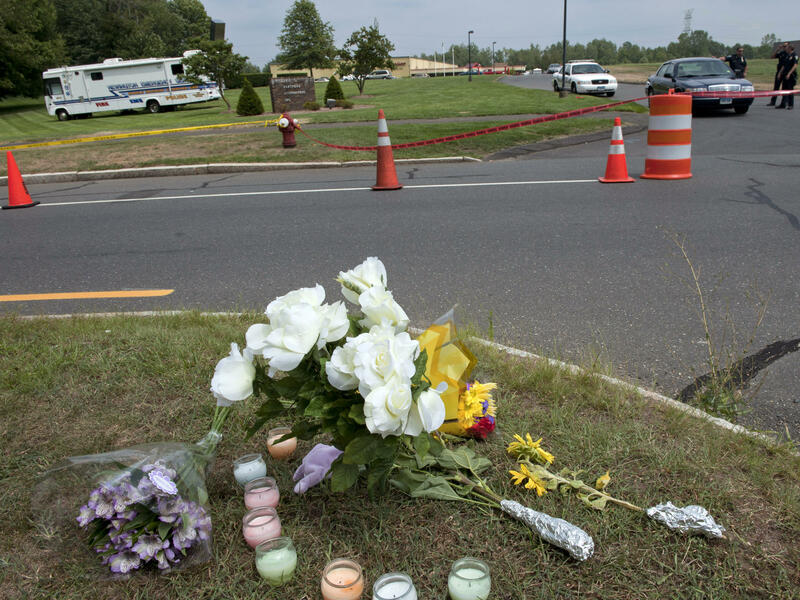 Flowers and candles are set up as a memorial in front of the entrance to Hartford Distributors following a shooting Aug. 4, 2010, in Manchester, Conn. Eight employees were killed by a former worker. Steve Hollander is still haunted by an event that happened five years ago last month. He is executive vice president at Hartford Distributors, in Manchester, Conn., which lost eight employees that early August day at the hands of former employee Omar Thornton. Hollander was wounded, but one of his colleagues yelled at the shooter and took a lethal bullet instead. "I probably think about it 30 times a day," Hollander says of the incident. But he doesn't remember ever worrying whether the shooter was capable of such violence. "He was quiet-spoken and did not seem violent or disturbed, not that anybody could tell," Hollander says. The company changed everything about its security system and how it fires people. Yet Hollander says he doesn't think it would've made a difference. "It's horrible because people ask me all the time now that you know what you know what could you have done? And the answer is: nothing, not much," he says. Workplace shootings garner lots of attention. But according to the Labor Department, over the past decade, workplace fatalities have been on the decline. Homicides at work in recent years have also declined — and robberies are the motives in most workplace killings. But experts say official statistics underestimate violence in the workplace, especially when it comes to nonlethal incidents. "The aggressor gets terminated and the injured person gets treated under worker's comp and so it doesn't necessarily get counted as violence in the workplace," says Margaret Spence, CEO of Douglas Claims & Risk Consultants, a human-resources consultancy. Also, she says, companies often want to keep the incidents hush-hush. "People terminate the person; they wash their hands. They figure, 'That's it. That's the end of them. They're out the door,' when in fact that's the beginning of the safety process," Spence says. So what can employers do if they see signs of disturbing behavior in an employee? In recent years, more employers are posting workplace violence policies, says Elizabeth Bille, associate general counsel for the Society for Human Resource Management. She says they should enforce them uniformly without giving first-time offenders a pass. At the same time, Bille says, if an employee has a mental health problem, employers are limited by federal law in their ability to discuss or share that information. "I think one of the greatest challenges about identifying potential workplace violence is trying to balance fairness to the employee to not overreact and keeping their particular situations confidential, with the very real concerns of co-workers who may start fearing for their safety," she says. "That is really the crux of the challenge here." The Occupational Safety and Health Administration provides safety guidelines for industries in health care and retailing, where patients and customers are most likely to perpetrate workplace violence. But, says Jordan Barab, the deputy assistant secretary, there is no prevention handbook when it comes to mass shootings. "In most of those cases you don't have kind of the same recognized risk factors; you don't have an ability in many cases for the employer to more or less predict that this is going to happen," Barab says. Hollander, the Hartford shooting survivor, agrees. "This is the most unlikely place I could ever imagine something like that happening," he says. With all the changes the company has made since, Hollander still feels like there's no such thing as zero risk. "The sad fact is, is with all of the security measures you take in place, we could have fobs and bulletproof glass and fences and security guards. But someone intent on mayhem is going to commit mayhem, and all you can do is slow them down and help people get out of the way." The shootings on live TV of two young journalists last month highlighted the perils of dealing with potentially dangerous employees. Prior to that Roanake, Va., attack, a former employee and alleged shooter, Vester Flanagan, had reportedly shown violent tendencies at work. But as NPR's Yuki Noguchi reports, it can difficult for employers to know when and how to step in. YUKI NOGUCHI, BYLINE: Steve Hollander is still haunted by an event that happened five years ago last month. STEVE HOLLANDER: I need the cops here at Hartford Distributors right away - shooting. UNIDENTIFIED OPERATOR: What's going on? Who got shot? HOLLANDER: Somebody got shot. I got shot. NOGUCHI: Hollander is the executive vice president at Hartford Distributors, which lost eight employees that early August day at the hands of former employee Omar Thornton. UNIDENTIFIED OPERATOR: Did you say he used to work there? HOLLANDER: Yeah, till I just fired him. HOLLANDER: Today - just now, before he started shooting. He's chasing people out in the parking lot. NOGUCHI: Hollander was wounded, but one of his colleagues yelled at the shooter and took a lethal bullet instead. HOLLANDER: I probably think about it 30 times a day. NOGUCHI: But he doesn't remember ever worrying if the shooter was capable of such violence. HOLLANDER: He was quiet-spoken, you know, did not seem violent, or disturbed or - not that anybody could tell. NOGUCHI: The company changed everything about its security system and how it fires people, yet Hollander says he doesn't think it would've made a difference. HOLLANDER: It's horrible because people ask me all the time, now that you know what you know, what could you have done? And the answer is, nothing, not much. NOGUCHI: Workplace shootings garner lots of attention, but according to the Labor Department, over the last decade, workplace fatalities have been on the decline. Homicides at work in recent years have also declined, and robberies are the motives in most workplace killings. But experts say official statistics underestimate violence in the workplace, especially when it comes to non-lethal incidents. Margaret Spence is CEO of Douglas Claims & Risk Consultants, a human resources consultancy. MARGARET SPENCE: The aggressor gets terminated and the injured person gets treated under worker's comp, and so it doesn't necessarily get counted as violence in the workplace. NOGUCHI: Also, she says, companies often want to keep the incidents hush-hush. SPENCE: People terminate the person. They wash their hands. They figure, that's it, that's the end of them, they're out the door, when in fact that's the beginning of the safety process. NOGUCHI: So what can employers do if they see signs of disturbing behavior in an employee? Elizabeth Bille is associate general counsel for the Society for Human Resource Management. She says, in recent years, more employers are posting workplace violence policies. She says they should enforce them uniformly without giving first-time offenders a pass. At the same time, Bille says, if an employee has a mental health problem, employers are limited by federal law in their ability to discuss or share that information. ELIZABETH BILLE: I think one of the greatest challenges about identifying potential workplace violence is trying to balance fairness to the employee, to not overreact and keeping their particular situations confidential, with the very real concerns of co-workers who may start fearing for their safety. That is really the crux of the challenge here. NOGUCHI: Jordan Barab is deputy assistant secretary of the Occupational Safety and Health Administration. His agency provides safety guidelines for industries in health care and retailing, where patients and customers are most likely to perpetrate workplace violence. But, he says, there's no prevention handbook when it comes to mass shootings. JORDAN BARAB: In most of those cases, you don't have kind of the same recognized risk factors. You don't have an ability, in many cases, for the employer to more or less predict that this is going to happen. NOGUCHI: Steve Hollander, the Hartford shooting survivor, agrees. HOLLANDER: This is the most unlikely place I could ever imagine something like that happening. NOGUCHI: With all the changes the company has since made, Hollander still feels like there's no such thing as zero risk. HOLLANDER: The sad fact is, is with all of the security measures you take in place, we could have fobs and bulletproof glass and fences and security guards, but someone intent on mayhem is going to commit mayhem. And there's - all you can do is slow them down and help people get out of the way.